There are many changes undergoing down here and it’s not by chance that I haven’t published a lot recently on the blog. Starting from September, the content I’m sharing on this blog and on my social media will change consistently. Recipes will mostly disappear, but I wish you will keep following and supporting me. Let’s farewell to the recipes on my blog and social media for a while, sharing today a dish I’d wanted to try for years and I took the occasion to make it for this summer edition of Cucina Conversations (what’s Cucina Conversations? Here I explained the project) about “stuffed”. 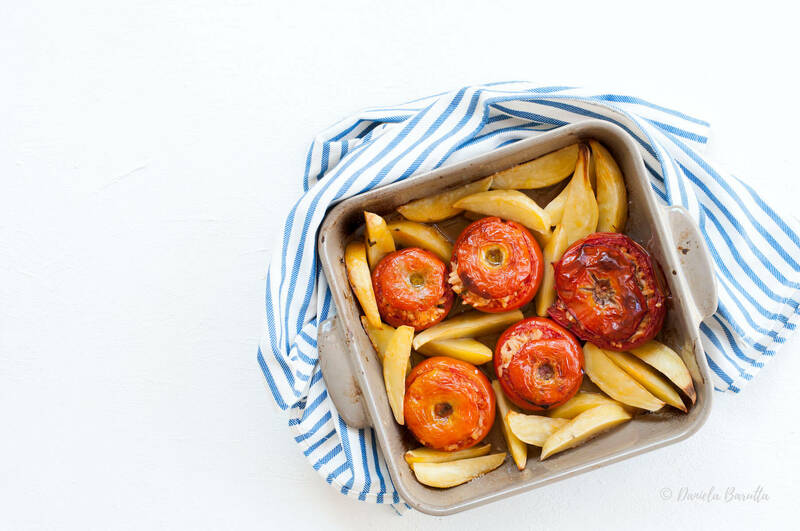 Pomodori al riso alla romana – baked stuffed tomatoes with potatoes – are a traditional Roman dish and they became quite popular on social media in the recent years thanks to some English and American food writers living in Rome, and appreciating its food culture. If I think about this dish, my mind goes to Rachel Roddy’s article on The Guardian,. The first time I read it, I strongly wanted to try it. 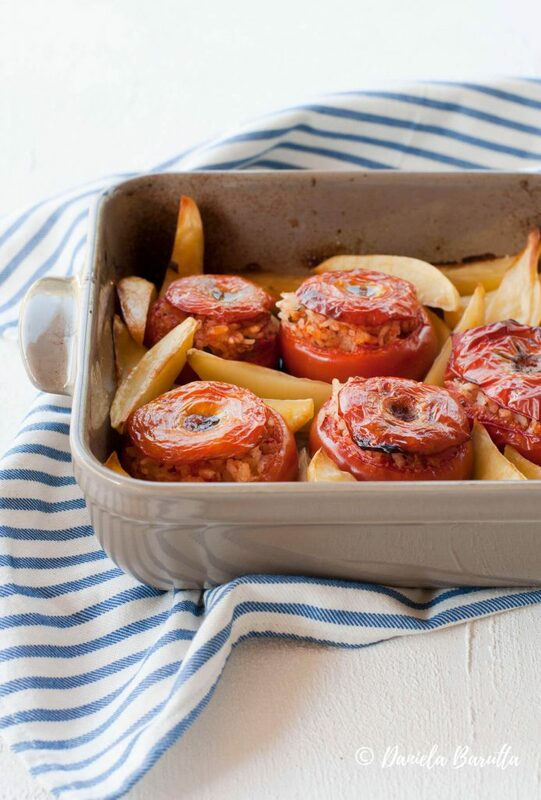 This is a dish from cucina povera, based on essentially three main ingredients: tomatoes, rice and potatoes. 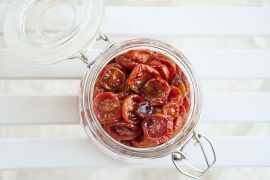 As Rachel says, it’s simple but requires patience and attention to the details: choose medium-big sized round tomatoes (in Italy we call them pomodori tondi), ripe but still firm, and follow the recipe step-by-step respecting the time at each stage. 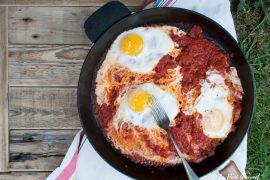 And yes, if you have already read the recipe and you’re wondering, the rice you add in the tomatoes has to be raw because in this way it cooks in the oven without becoming mushy. It’s true, it’s not the quickest recipe and we do have to turn on the oven (and in summer it could be painful), but you can make it in advance and just warm it up in the oven for about 10 minutes before serving. 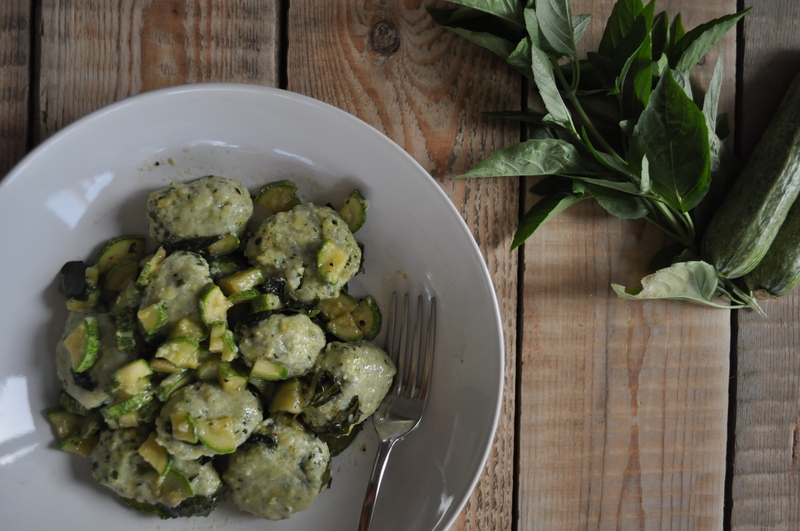 I can’t wait to make this dish again with the next batch of pomodori tondi from my garden. For other great recipes of stuffed food, head to the blog posts of my fellow blogger (link at the end of this post). 1.Cut the tops of the tomatoes and keep them aside. Scoop out the inside of the tomatoes and put the flesh and the juices in a bowl. If you wish, sieve the juice so you can remove the seeds (I didn’t do it). 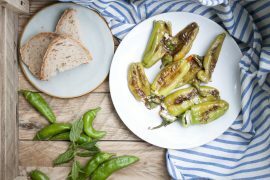 Mash the tomato flesh with your hands, or using a food mill, and add the garlic cloves you have previously finely chopped, the raw rice, 30 ml of extra virgin olive oil, salt, pepper and the basil leaves broken into pieces. Cover the bowl and let it rest at room temperature for about one hour. 2.In the meantime, sprinkle some salt in the cavity of each tomato and put them upside down on a board, so they can loose the extra water. After one hour, put the tomatoes on a baking tray and spoon the rice and tomato mixture into each shell, so that they are about ¾ full and cover with the tomatoes tops and sprinkle with some salt and pepper. 3.Toss with salt and the remaining extra virgin olive oil the potatoes – you have previously peeled and cut lengthwise in big chunks. Bake in the oven at 180°C for about 1 hour, turning the grill on for the last five minutes. If you prepare it in advance, you can warm it up for about ten minutes in the oven at 160°C.